Okay. Who in here knows how to solve level 13/20? *fails to solve Level 788 Should there be YouTube walkthroughs of this? I loved this so much! Some really clever and fun variations on the basic picross formula. Love the game! I love picross, and it's always interesting to see your alternate clues. Get rid of the ? clue type. It's utterly pointless. The pink clue type makes things a little too easy, perhaps nerf it a bit? Some of the levels have multiple solutions. Also, there are a few too many example puzzles after each new clue type. 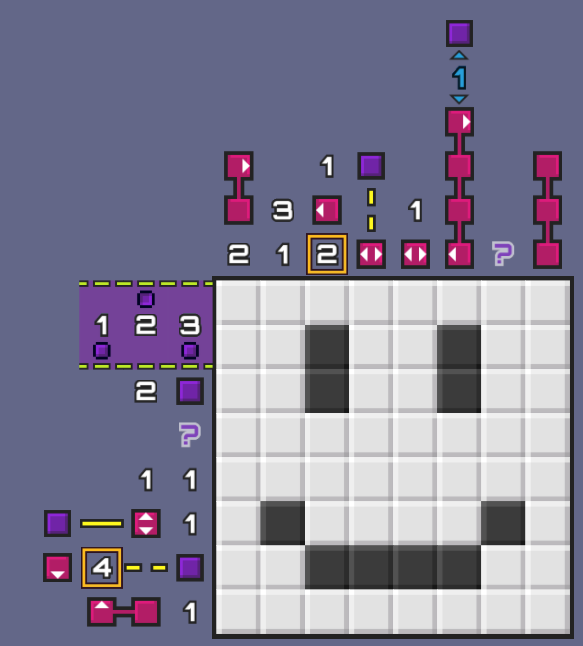 as a picross addict, who even finds "mega picross" easy as heck, this re-wired my brain in a brilliant way! will definitely download the game on google play. hopefully you can expand the game more and more. good luck!